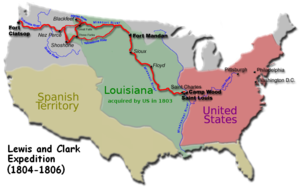 The Lewis and Clark Expedition was an expedition by Meriwether Lewis (1774–1809) and William Clark (1770–1838), two men chosen by United States President Thomas Jefferson to explore the Louisiana Purchase, which the country had just bought from France. (This land was made up of much of what is now the Central and Western United States). They left Saint Louis in 1804, leading a group of 33 people. The group reached the Pacific in 1806, viewing much of the West on the way and writing down what they saw. Along the way, the group was joined by a Shoshone Native American woman named Sacagawea, who helped guide them. After their exploration, Lewis became Governor of Louisiana Territory, and Clark became Governor of Missouri Territory. The only person that died on the trip was Sergeant Charles Floyd who died August 20, 1804 of Dysentery. ↑ "Lewis and Clark . Inside the Corps . The Corps". pbs.org. Retrieved February 4, 2011. ↑ "Sacagawea". mathcs.bethel.edu. Retrieved February 4, 2011. ↑ "Lewis & Clark National Historic Trail - Meriwether Lewis (U.S. National Park Service)". nps.gov. Retrieved February 4, 2011. This page was last changed on 22 February 2019, at 16:13.